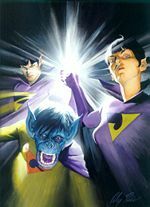 Planning and inspiration: the Wonder Twins! So often when we feel overwhelmed we’ll think “what I need is a PLAN.” And we diligently go about setting meetings, making to-do lists and re-arranging our schedules. This isn’t bad, but it’s helpful to remember that planning alone doesn’t refuel your tank. You can have a great destination and map, but to get you there, you also need to reconnect with a sense of inspiration. To move you forward, you need the Wonder Twins – planning AND inspiration. Take five minutes to be thankful. Even for simple things, like the fact that its over 60 degrees, your shirt is clean, and you ate a good lunch. Really let yourself wallow in gratitude! Imagine what it will feel like to reach your destination. What do you feel in your body? How will you celebrate? Focus your attention on someone you love, and think of three things you really appreciate about them. Then tell them. Go for a walk somewhere green and quiet. Think about the last time you felt inspired – what helped? Do it again! Ps. If you’re a nonprofit leader or volunteer, you may want to come check out a workshop about strategic planning I’m co-facilitating with my talented and lovely colleague Angela Powell on October 9th in Seattle through the the United Way of King County. We’ll be covering the magic of the Wondertwins, as well as the nuts and bolts of a good planning process, and we’d love to have you there!